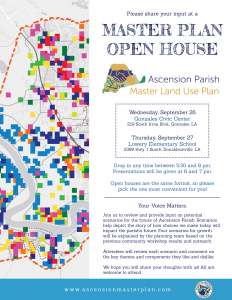 On November 28 and 29, 2018, Ascension Parish hosted two public open houses. 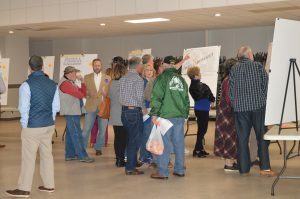 With one on the East Bank and one on the West Bank, the planning team was able to hear from approximately 85 Ascension Parish residents from both sides of the river. 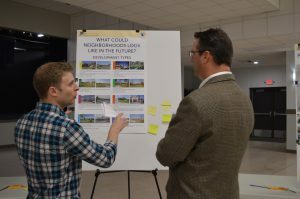 The open houses showcased the plan’s draft vision as well as the guiding principles participants helped prioritize earlier in the process. 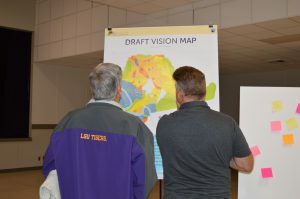 During the open houses, attendees reviewed and commented on a draft vision map, vision map categories, indicators, and learned what the plan will do to address land use and development patterns, drainage and stormwater management, and transportation and mobility. 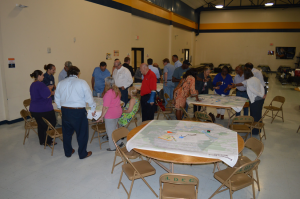 Preliminary solutions from the Ascension Parish Transportation Master Plan, developed by HNTB under a separate initiative, were also available for review. Comments on the transportation solutions will be provided to HNTB and the final transportation recommendations from the Transportation Master Plan will be incorporated into the Ascension Parish Master Land Use Plan. 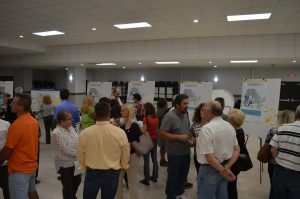 On September 26 and 27, 2018, Ascension Parish hosted two public open houses, with one on the East Bank and one on the West Bank. 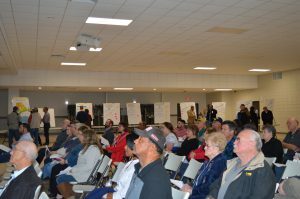 Over 130 Ascension Parish residents attended. 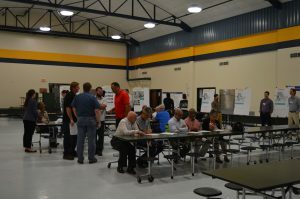 During the open houses, residents were presented with the digital results from the June mapping workshops and reviewed key themes emphasized by workshop participants such as infrastructure issues, drainage, sewage, outdoor recreation, and wetland preservation. 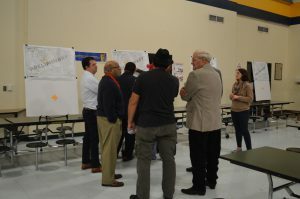 Open house attendees then analyzed and commented on several display posters which highlighted ‘scenarios’ showing different types of growth and measurable indicators. Scenario planning allows residents to view development with a range of potential futures and pinpoint their preferences. 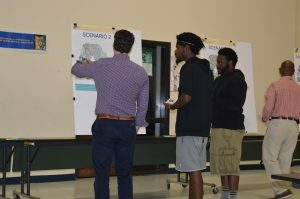 At the open houses, residents shared what they liked and disliked about each scenario by leaving comments on the boards and completing a survey about the scenarios and guiding principles. For a period of time after the open houses, the surveys were also available to complete online. 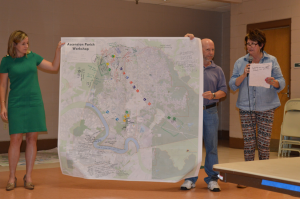 In September 2018, planning team member Lauren Marschall updated the Ascension Parish Planning Commission on the land use plan’s progress. The presentation reviewed how the results of the June 2018 workshops have been used to create scenarios depicting possibilities for growth, and how a scenario is constructed. The resulting scenarios will be presented to the public for feedback at open houses on September 26 and 27, 2018. 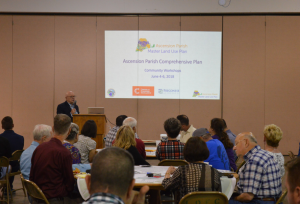 In July 2018, planning team member Janet Tharp briefed the Ascension Parish Planning Commission on initial results of the June 2018 Community Workshops. The presentation gave an overview of how workshop maps were digitized and analyzed, and how the results will be used to create scenarios. 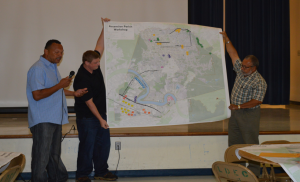 The resulting scenarios will be presented to the public for feedback at open houses on September 26 and 27, 2018. 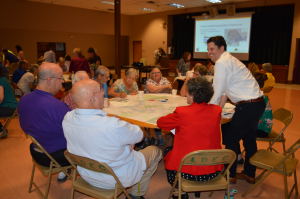 On June 4,5, and 6, 2018, over 150 Ascension Parish residents attended community workshops. 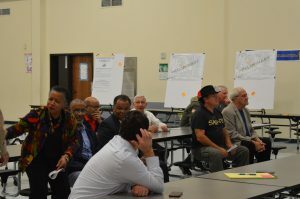 During the workshops, residents learned about the parish’s expected growth rates and current development trends throughout the U.S. 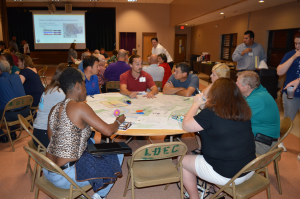 The core of the workshop centered on a map exercise in which residents gathered in small groups to discuss issues such as infrastructure improvements and goals for land use planning. 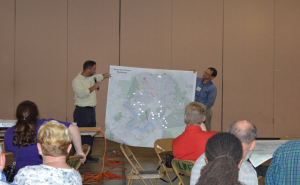 They were asked to consider what type of development they envisioned for the future of Ascension. 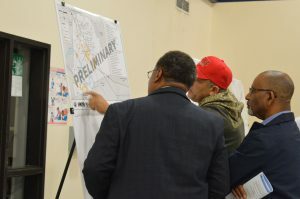 Using representative stickers or “chips”, residents filled their maps with potential development types as well as indicating areas to preserve and needed transportation infrastructure. Each table then presented their maps to the larger group, identifying their group’s priorities for growth and improvement and the reasoning behind their chip placement. 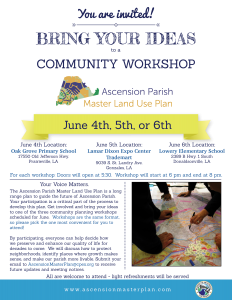 The resulting maps of the community workshops are digitized to create a full scope of scenarios and draft a vision for a master land use plan. 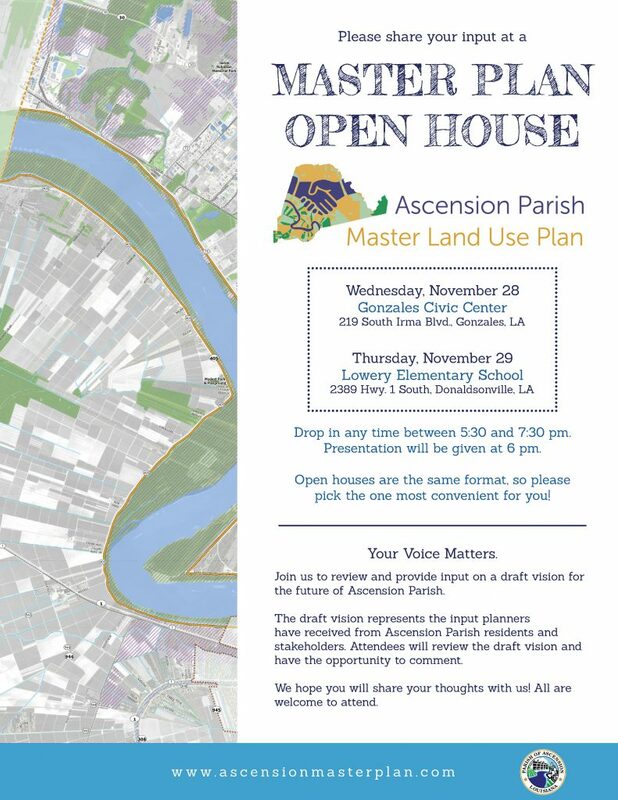 Ascension Parish has established a stakeholder committee comprised of local residents and representatives to help work through the issues at hand as the master land use plan is created. The stakeholder committee represents a broad set of interests and perspectives throughout the parish. This chart is a product of one of the committee’s discussions from April 2018. It summarizes some of the strengths, weaknesses, opportunities and threats for the parish of Ascension as it addresses future growth.